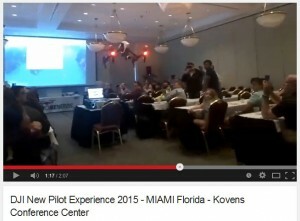 A video has surfaced which shows a DJI Inspire being used indoors for a presentation at an event called Live Ninja in Miami, where it flipped out of control, it’s unclear at this stage if the Inspire lost a prop or if the optical flow malfunctioned. The video was first posted on Facebook but was soon deleted but has now appeared on YouTube. We have said repeatedly (on our Twitter feed) that what we fear most are the injuries from multicopters being used indoors more-so than outdoors, this close call highlights that there is an accident waiting to happen. Sooner or a later there’s going to be a wedding reception filmed indoors by a multicopter that’s going to end up looking like a scene from A Nightmare on Elm Street. There are video-photographers already using the Inspire indoors for music videos, even some considering nightclub filming, this to us sounds alarming, does anyone even know if lasers, strobes and dry ice could confuse optical flow sensors? We do not think for a moment a finger of blame should be pointed towards video-photographers as the Inspire in particular has been marketed as being able to be flown indoors near people, even a DJI new pilot training event in Miami did exactly this. But our view is no multicopter, regardless of brand should be flown indoors near people apart from maybe small craft such as a Bebop. Given there are steadicams and handheld gimbals such as the Ronin and MōVI there really is no need to risk people for getting a smooth indoor shot. 2 words people, common sense!